pearl | 5mm | $9.30 per/decade - 6mm Crystal Pearl, White (Simulated pearls with a quality Austrian crystal nucleus and a deep, lustrous, long-lasting pearlized coating) - Med. pearl | 5mm | $9.30 per/decade - 6mm Crystal Pearl, Ivory (Simulated pearls with a quality Austrian crystal nucleus and a deep, lustrous, long-lasting pearlized coating) - Med. pearl | 5mm | $9.30 per/decade - 6mm Crystal Pearl, Pink (Simulated pearls with a quality Austrian crystal nucleus and a deep, lustrous, long-lasting pearlized coating) - Med. pearl | 5mm | $9.30 per/decade - 6mm Crystal Pearl, Night Blue (Simulated pearls with a quality Austrian crystal nucleus and a deep, lustrous, long-lasting pearlized coating) - Med. The Sisters of Carmel have been making quality rosaries for over twenty-five years, with both handmade wire links and knotted cord. We use the highest possible quality beads and parts, taking what steps we can to ensure the rosaries will last. We use bows instead of jump rings on our wire rosaries and sew the knots on the ends of cord rosaries to ensure they do not unravel. Click here to learn more about wire rosaries and here to learn more about our cord rosaries. 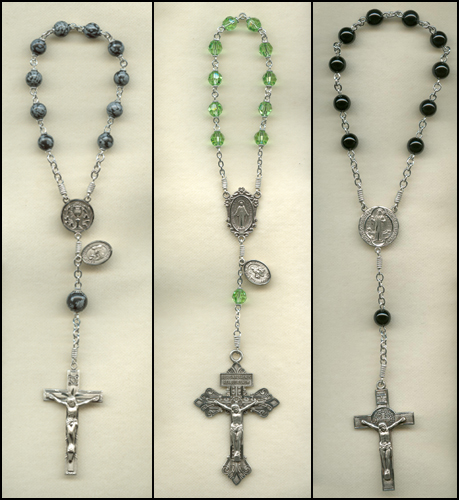 Since each rosary is handmade to order, we usually ask about three to four weeks to complete your order. If you have a specific date by which you need the rosary, please let us know in the comments section of your order. For information about shipping and returns on custom rosaries, please click here . 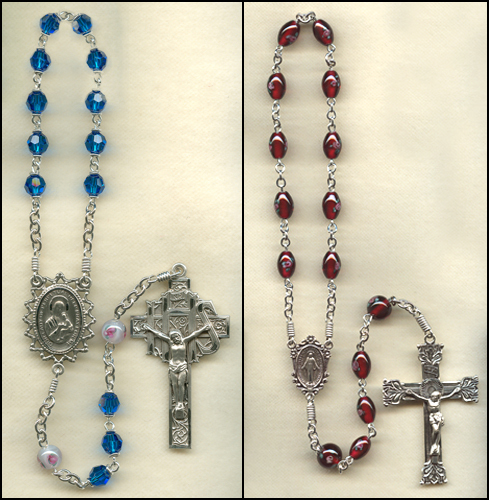 Besides standard 5-decade rosaries we make two different styles of 1-decade rosaries, and 15-decade rosaries. 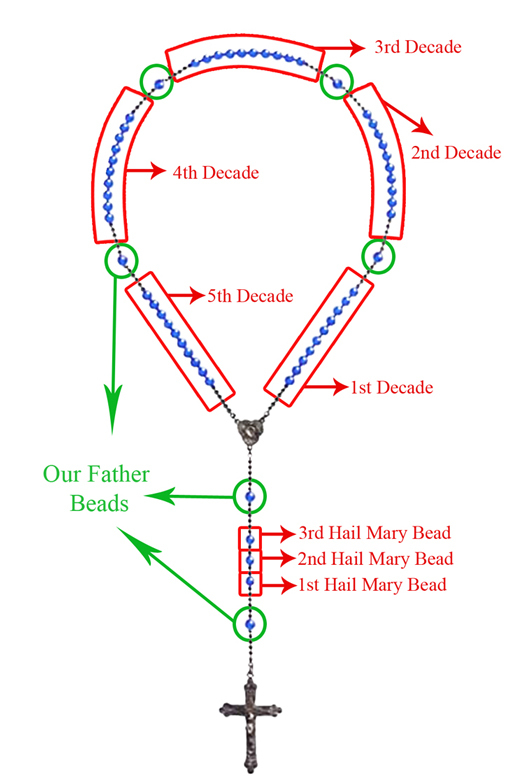 For one decade rosaries, since the rosary is small and the loop is only one decade, we put extra links between the Hail Mary beads to make sure there is room for someone’s hand while praying. One decade rosary style 1 has one Our Father bead between the centerpiece and crucifix of the rosary. One decade rosary style 2 has an Our Father bead, three Hail Mary beads, followed by another Our Father bead between the crucifix and the centerpiece. 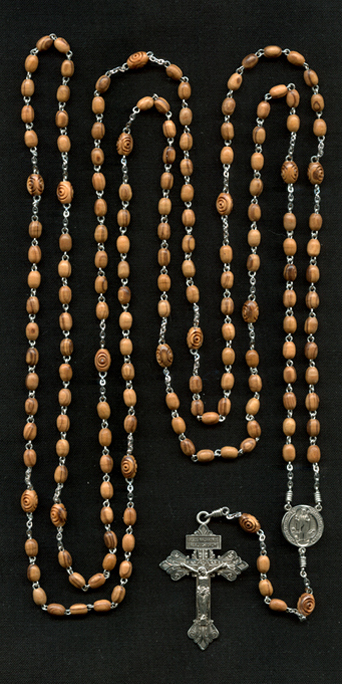 Below is a sample of a 15-decade rosary. Nickel silver – Nickel silver is a compound of nickel, copper and zinc, also called “base metal.” Though it does not retain the luster of other materials such as sterling and has no silver content, it is a strong, durable metal. We use nickel silver wire on rosaries with base metal parts. Silver oxidized – Our silver oxidized centers and crucifixes are composed of a solid brass core with a heavy silver plating and an antique finish, and each piece is individually die struck. Pewter – Our pewter pieces are produced here in the USA, with a special high grade pewter that is lead and cadmium free, developed to provide medals that are light and durable. You will find the same beautiful detail as on our sterling silver and gold filled pieces. Sterling silver – For our sterling wires, we use Argentian silver wire, which is more resistant to tarnishing. Our sterling silver crucifixes, centers and side medals are produced to the highest standards of artistry and workmanship by several exceptional manufacturers in the USA. All pieces come with a lifetime guarantee. Gold filled – Gold filled products give the look and feel of 14 karat gold for a fraction of the price. Gold filled, also called rolled gold or gold overlay, is made by heat and pressure, bonding a layer of karat gold to a brass alloy core. The exterior of the product, everything you can see or touch, is a solid layer of karat gold, in contrast to gold plated items, which usually consist of a microscopic film of gold particles covering a base metal by an electroplating process. Due to the particles, gold-plate has the tendency to chip, flake and wear off. The gold layer on gold-filled products is approximately 100 times thicker than gold-plate, and due to its bonding process does not tarnish, chip or wear off. For this reason, gold filled items are generally considered lifetime products. All of our products (including the wire, chain, beads, clasps and rings that we use on our gold filled rosaries and bracelets, as well as all medals, centerpieces and crucifixes) are 14/20 Karat gold filled. Wood inlaid crucifixes - Most of our wood inlaid crucifixes are made of rosewood or ebony with nickel silver or brass. Most of the styles we offer were either imported from a well known manufacturer in France (now closed), or are made right here in the U.S.A. by the Vexilla Regis Foundry, who learned their technique. The following charts and images are meant to help you build your rosary. Our Size Comparison chart shows the beads, crucifixes, and centers actual size. This might be helpful if you are not sure how well the different components you are choosing fit together. If you choose Czech lampwork Our Father Beads, you may wish to designate a color. Click here to see a color chart of what colors are available, and let us know what color you would like in the “additional comments section” before you add the rosary to your shopping cart. 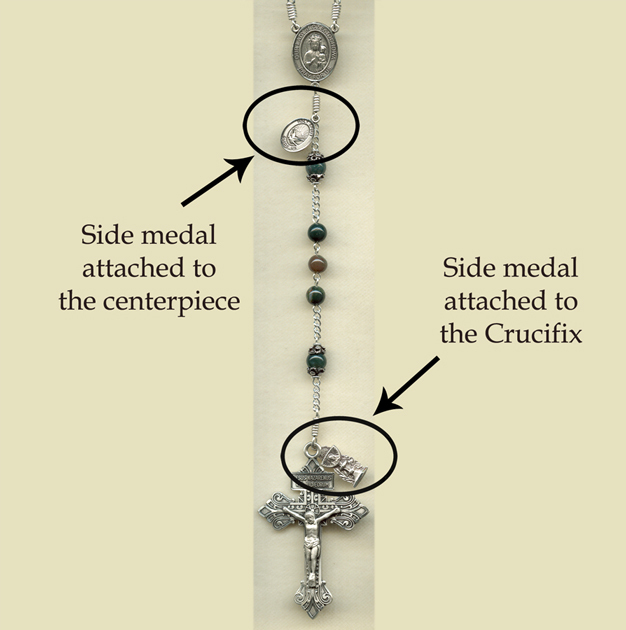 See the picture below for an idea of where any side medals you add to your rosary will be placed. You may add side medals to the bottom of the centerpiece and the crucifix on your rosary. If you are having trouble choosing a centerpiece or side medal, see our Patron Saint index for a list of Saints and their patronages. The only bead that we allow for multi-colored rosaries are the Austrian crystal. To build a multi-colored rosary, choose the wire+chain rosary, glass and crystal beads, and the “multi-colored” option (the last in the list) when asked to choose a color. You may designate colors for each of the decades, the first, second, and third Hail Marys on the “tail” of the rosary, and the Our Father beads (if you do not wish to choose some other special bead for the Our Fathers). Click here to see the color chart of available colors. See the image below as a reference for the placement of the beads and decades, and designate what colors you would like where in the “additional comments” section of your order. Of course you may also contact us if you have questions. I am very pleased with my rosary. It's what I've been trying to find for a long time now. Thank you so much for making it. I lament not being able to attach a pic to this review to show you just how beautiful the olive wood rosary truly is, made for me by the Sisters. Anything you purchase from the Sisters is going to be very carefully sourced for material, artistic and Traditional quality. The olive wood beads of my rosary are all beautiful and have a very subtle aroma, something I remember from many hours praying the rosary with my mother as a child. The center piece and the saints medals are all highly detailed and of very high quality. The crucifix, mine a wooden crucifix with silver Christ image, is exceptionally fine. These rosaries are well worth the cost for anyone to whom devotion to Our Lady with the rosary is a cherished practice. And needless to say, the quality of the good Sisters' handcrafting is without blemish. The Sisters’ reputation for making beautiful, durable rosaries precedes them. I mentioned to my priest that I had been searching the web to find a high quality, custom made rosary to give to my husband for his birthday. I asked him if he knew anything about The Sisters of Carmel and the kinds of rosaries they made. He replied that he did. He had ordered a few rosaries for gifts from the sisters in the past. He confirmed how sturdy and lovely they were, and that he had no doubt they would last for many years to come. Suffice to say, I went ahead and ordered a rosary from the Sisters of Carmel and was not disappointed. My husband’s rosary truly is a thing of beauty. Being able to customise it to his personal likes and preferences was a little like going on a detective hunt. It was a fun process to design it, and the sisters themselves were an absolute pleasure to deal with. I could not be more delighted with the end result! I love my custom rosary...exactly as I wanted it, and a work of art. Really, it's an heirloom to be passed down through generations...and is so sturdy that it will last that long! The custom rosary you made me with the Pardon Crucifx I sent you has arrived! All I can say is WOW! It is really lovely and will be very dear to my heart. You are right; those large carved olive wood beads are very, very nice. They feel wonderful in the hand. I could not be more pleased! As always, your craftmanship is so awesome there are no words to describe! How DO you make these wonderful tiny IDENTICAL loops? I have never seen such perfection! Thank you, thank you! The centerpiece you chose is perfect! I've ordered a few custom rosaries from the Sisters; each one is a sturdy and beautiful heirloom-quality work of art. You'll never need another rosary. What high-quality, exquisite work the sisters create! For a dear friend, I ordered a rosary that implemented his birthday stone, turquoise—plus a medal of his favorite saint, Padre Pio. I also chose a cross that included Mary; a Holy Spirit centerpiece; a St. Kevin medal; and, for the Our Father, larger beads of silver. The final product was stunningly beautiful, even lovelier than I had imagined... Thank you so much, Sisters of Carmel! I can’t wait to give this special gift to my friend on his birthday. God bless you all for your faithfulness to Jesus, and for the excellent work you do on His behalf!